Federal Constitutional Court rejects constitutional complaint by unsuccessful candidate. Today the President of FAU, Prof. Dr. Karl-Dieter Grüske, appointed Dr. Sybille Reichert as Chancellor with effect from 16 June 2014. Beforehand, the Federal Constitutional Court informed the University by telephone that it had rejected a constitutional complaint related to the appointment which was raised by an unsuccessful candidate. Dr. Sybille Reichert has been regarded highly in Europe as an expert in the area of university development for many years. After studying Philosophy and English Studies in Brussels and Heidelberg and completing her doctoral degree at Yale University in 1994, Dr. Sybille Reichert worked as an advisor for higher education, initially at the European Commission and later as an independent advisor for European organisations, ministries and universities. From 2002 to 2004, she was head of strategic planning at ETH Zurich, Europe’s leading technical university. In 2005, Dr. Sybille Reichert founded her own consulting company, Reichert Higher Education Consulting. Her clients include the European University Association, the League of European Research Universities, Stiftverband für die Deutsche Wissenschaft, the Swiss Science and Innovation Council, several ministries for education and science from across Europe and numerous universities, such as the universities of Bremen, Konstanz, Mainz, Basel, Bern and Lausanne, the Norwegian University of Science and Technology in Trondheim, Trinity College Dublin and universities in France, Denmark and Spain. She speaks five languages. The process for the appointment of FAU’s Chancellor took more than a year. 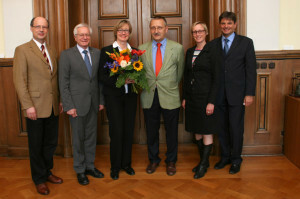 On 22 February 2013, the University Council unanimously proposed Dr. Sybille Reichert as the successor to Chancellor Thomas A.H. Schöck, who was leaving to enter retirement. An unsuccessful candidate appealed against this decision before the Administrative Court in Ansbach. In the subsequent summary proceedings, the Administrative Court prohibited the University from appointing Dr. Sybille Reichert. This resolution was repealed by the High Administrative Court of Bavaria on the basis of the complaint submitted by FAU on 17 February 2014. In doing so, the High Administrative Court endorsed the University’s decision and made it clear that a modern interpretation of the Chancellor’s profile is still in keeping with the Bavarian Higher Education Act. The unsuccessful candidate then proceeded to appeal to the Federal Constitutional Court. However, this constitutional complaint was unsuccessful as it was not accepted by the Federal Constitutional Court. Following the appointment of Dr. Sybille Reichert as Chancellor, the previous Chancellor Schöck is now able to enter his well-deserved retirement which he had delayed due to the pending case at the Executive Board’s request. ‘Both personally and on behalf of the University, I would like to sincerely thank Thomas A.H. Schöck for his willingness to ensure that continuity was maintained at the top level of the University Administration during this difficult and uncertain period,’ says Prof. Grüske. Today, at a small, informal ceremony, FAU President Grüske presented the previous Chancellor with the certificate which officially confirms the start of his retirement on 15 June. Beschreibung: Founded in 1743, FAU has a rich history. It is a strong research university with an international perspective and one of the largest universities in Germany. Our values of innovation, diversity and passion are the key to our leading positions in both national and international rankings. We invite you to learn more about FAU and become a part of the FAU family.